President Donald Trump gestures to the crowd during a campaign rally in Charlotte, N.C., Oct. 26, 2018. 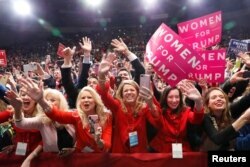 President Donald Trump will campaign in eight states in the final days before Nov. 6 U.S. congressional elections, putting most of his attention on tight races in which Republicans have a shot at winning Senate seats, White House officials said Friday. From Wednesday until Election Day, the president will make campaign stops in Florida, Missouri, West Virginia, Indiana, Montana, Ohio, Georgia and Tennessee, the officials said. Trump, who was making campaign stops in North Carolina Friday night and in Illinois Saturday, is scrambling to head off a Democratic push to take control of the U.S. House of Representatives and possibly the Senate. Supporters participate at a campaign rally in Charlotte, N.C., Oct. 26, 2018. A man was charged in Florida earlier Friday in connection with the bombs. Bolstered by a recent uptick in his job approval ratings to the high 40s in opinion polls, Trump is hammering away at two major themes: illegal immigration and the contentious Senate confirmation battle over U.S. Supreme Court Justice Brett Kavanaugh, who denied accusations of sexual misconduct. He is also promoting a plan for middle-class tax cuts. In Florida, Trump will seek to boost the Senate campaign of Florida Governor Rick Scott, who is in a tough race against veteran Democratic Senator Bill Nelson, as well as lend a hand to U.S. Representative Ron DeSantis in his gubernatorial race against Democrat Andrew Gillum.